heather & olive: butternut squash lasagna. Not my photo, but I swear it looked identical. In a bowl, stir together the ricotta, sage, 3 Tbs. of the parsley and the garlic, and season with salt and pepper. Set aside. In an oval Dutch oven over medium heat, warm 1 Tbs. olive oil. Add the onion and cook, stirring occasionally, until softened and lightly browned, about 15 minutes. Transfer to a bowl. Spread 1/2 cup pasta sauce in an even layer on the bottom of the Dutch oven. 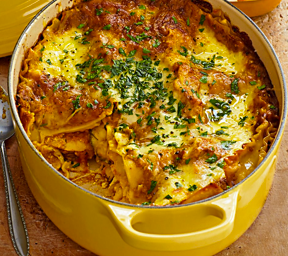 Arrange a single layer of lasagna noodles on top, tearing them as needed to fit. Spread 1/2 cup ricotta mixture on the noodles and scatter a handful of onions on top. Spread 1/2 cup pasta sauce over the vegetables and sprinkle 1 cup fontina on top. Layer the noodles, ricotta, onions, sauce and fontina 3 more times, omitting the sauce and fontina on the last layer. Top with the remaining noodles, sauce and fontina. Transfer to the oven and bake until the sauce is bubbly and the cheese is melted and browned, 45 to 50 minutes. Sprinkle the remaining 1 Tbs. parsley on top. Serve with Parmesan cheese. The Williams-Sonoma recipes calls for their Pumpkin Parmesan sauce, but I'm partial to Dave's Gourmet Butternut Squash sauce--I used that instead. Also, W-S adds summer squash and zucchini but since I'm not a fan I just did onions. I will definitely be making this again: the fontina takes it to the next level and it keeps well for leftovers. I might add some chicken sausage next time to make it even heartier...but this definitely put me in the fall spirit. Adding this to my Vermont cooking list for winter. Looks so good!